Building a new cabin is sure to be one of the most exciting projects you’ll ever undertake. With a careful eye and thoughtful planning you can have everything you’ve dreamed of and more. We’ve put together some of the most common areas of consideration for your review so that you’re not overlooking any important planning concerns. If you have other questions, which we’re sure you will, just contact us at any point in the planning process! Location – the practical and the pretty. There’s a lot to consider when it comes to finding the perfect new spot for your prefab cabin. If it’s going to be a secondary structure, maybe you’ll want to run electricity and plumbing to your cabin for a sink, toilet, bath or shower. How close is the location to hookups? Are there any factors that may hinder your ability to run the hookups? When it comes to cabin location, the view is likely to be one of the most important considerations. Lake location, trees, surrounding foliage (and weather) can be very different from one season to the next. Some people want to maximize sunshine (and the view), all year round and build atop of a hill. Others want shade in the afternoons at the height of summer when windows magnify the heat. What about road access? Are you more concerned with an attractive location or one with the easiest access? Or somewhere in the middle? If your property’s large, how far from the road do you want to be? If it’s a busy road, the farther away for it, the quieter it will be, but what about parking? Is there a lot of snow in the winter and will you need to dig your way through? It may make sense to lay a parking pad while creating a foundation for your cabin (more about this below). Once you decide on a site, choose a size that’ll suit your needs (see the next topic below), and here is a very useful tip: Stake out your bunkie size on the chosen site. Ensure that it fits and imagine how you’ll utilize the interior space. In particular, think about door and window placement. What’s the view? How will you get from the front door to the vehicle? Try walking there from where you’ll park. Decisions about the size and location of your bunkie are not always in your hands. Check with your municipality to ensure that you are meeting the local zoning and building permit requirements. Since it’s not likely that you’ll be building a cabin that is under 100 sq. ft. you’ll need to have all your t’s crossed and i’s dotted. Other stipulations may include a 2 or 3 foot setback from property lines, some areas even have regulations regarding how close structures can be built near water. Check first and then check again! Inspectors will make you change things if you contravene local bylaws. Once again your list of cabin uses will help determine how to design the interior. Is your space to be open concept or will you divide it into rooms with partitions to allow privacy for yourself and guests? Are you considering a loft? If so, you’ll need some extra space for a staircase. Allow plenty of space for storage. Consider cupboards, shelves, mud room, sunroom, porches etc. See our suggestions for interiors. There are so many design options unique to Summerwood cabins, that will suit to your tastes and needs. Our cabins are available as single floor, 1 1/2 floor (lofts), and even 2 story designs. Our cabin design team are literally pros at this, so use them when designing your cabin kit. You’ll save time and ensure that you get exactly what you want. With all the sumptuous styles of cabins that we offer, you’re sure to find what you want here at Summerwood. Check out our favorites to benefit from the thinking that others have done before you. Select the style that fits your landscape and reflects your taste best. Then customize the cabin to address any functional issues and to add your own personal touch. Consider too, how you’ll “decorate” the area around your new cabin. Shrubs, flowers and running vines entwined through a trellis create an earthy English garden feel. Or perhaps you’ll want to clear the front for a nearby fire pit. (Be sure it’s far enough away from your cabin for safety.) Would you like a path of flagstone to lead to the front door? It’s the little things that personalize and make your cabin uniquely yours. When you’re ready, select a style from below or go straight to our Custom Design Center. Don’t forget that you can involve our design team at any stage! This is always a bit of a tough one. We like to tell customers that there is no wrong choice; but that is, before you build it! What we really mean is that there are no rules, except what you need for your circumstances. What you need to consider. Clearly the key is to ensure that your space is large enough for its intended purposes, while remaining proportional to the setting. How many people do you need your cabin to sleep? Do you want a porch to sit on and watch the world go by? Is it just sleeping space or do you need to apportion other rooms to read, dine in or just pass the time with a card game when the weather’s foul? Keep all the purposes of the cabin in mind while planning its size. Are you thinking storage and sleeping space? A dual-purpose cabin doesn’t have to be big, providing you assign different uses to different spaces and incorporate some thoughtful and inventive design into your plan. Be sure to view our sample floor plans and utilize our floor plan grids. They’re a huge time-saver. What you need to know. Remember that in most areas, structures of less than 100 sq. feet usually don’t require permits. Maxing out at about 80 sq ft of living space, our Canmore Bunkie is designed just for that. For many that may be a bit too “cozy”. It all depends on your needs. Again, check with your local municipality for permit requirements. This library of regional listings may have the local government office you should contact. Once you’ve decided on a size, it’s a good idea to test it. Place some stakes in the ground and outline the sides of your proposed cabin with a string. It sounds odd, but for most people it’s hard to get an idea of what they need until they do it. This mock space gives you the opportunity to experiment before you’ve put down any money. Adjust the stakes until you’re happy with the size and record the dimensions. It’s not uncommon for people to love their cabin more than their primary residence. They want it to last for a lifetime and pass it on to loved ones. That’s why Summerwood only uses the finest materials on the market. 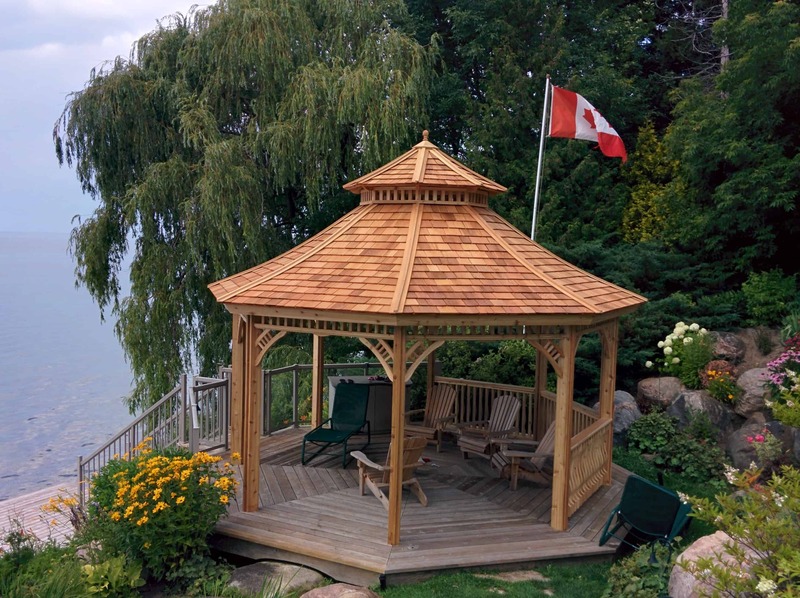 Most of our cabin kits are constructed from a premium grade of western red cedar. However we also offer our structures in durable and attractive Canexel maintenance-free wood fiber siding in a variety of vibrant and outdoorsy colors. Different materials create different looks – remember that when you’re adding new structures on your property. You can have them complement one another or be a little eccentric and let them stand on their own. There’s no wrong decisions, just interesting ones! Learn more about our materials and siding choices. Shingles – Available at your local hardware store and can be installed on any of our cabin kits. Whatever type you choose, be sure to follow the installation instructions closely. Please refer to the shingles section on our website to determine the quantity of shingles that you will require. Roofing – In most applications we use 4 x 8 sheets of 7/16″ OSB sheets for sheathing. You may want to upgrade to fir plywood, or consider cedar for a more finished appearance. Trusses & rafters – In most applications we use spruce (dimensions vary depending on size and style). Other materials such as cedar may be preferred. View detailed information on all our material choices. See detailed information on all our material choices. Summerwood cabin kits are a do-it-yourselfer’s dream come true – even if you’re only dreaming about becoming a do-it-yourselfer. There’s a detailed, step-by-step set of instructions and live help that is always just an email or toll-free phone call away. Just be sure that you have the time, energy and tools to complete the project. Our cabin kits make building a cabin a project anyone can do, whether you’re handy or not. Learn more about its assembly and required tools. Or if you think you’d rather have someone build it for you, this how to hire a contractor package is very helpful. Choose your favorite cabin style – we love them all! Remember, our buildings can be customized to your own personal requirements. They range in size from as small to as big as you want. View many of these cabin styles below in 3D. Canmore Cabins – With its generous front porch and soaring loft area, it’s no wonder the Canmore is a favorite with our customers. It’s the look that says bring on the weekend! Kepler Creek Cabins – The Kepler Creek’s gently sloping roof provides a roomy open loft. The optional dormer adds charm and the extra light is welcome all year round. Sonoma Cabins – Sonoma cabins can rewrite family histories. Its steep gabled roof provides the owner plenty of loft space to store camping equipment or use as a sleeping area. Its modern charm is at home in any setting. So get out of the city and enjoy the lake like you’ve been dreaming about with our cabin kits. Breckenridge Cabins – There’s a down-home simplicity to the Breckenridge that seems to instill calm. The gable roof provides much needed upper storage space. Customize the Breckenridge to suit your tastes. Cheyenne Cabins – Its steep gabled roof provides the Cheyenne’s owner plenty of loft space. Its rustic charm is enhanced by the cozy porch and overhanging roof. Mountain Brook Cabins – Practical and charming. The gently sloping 7:12 pitch roof offers extra space for storage or sleeping. Speaking of sleep, relax and spread out on the 4 ft deep porch! Glen Echo Cabins – An attractive favorite for cabiners. The canopy created by the 2- or 3-foot overhang provides welcome shade on a sunny day and protection from the rain on a cloudy one. Bala Bunkie Cabins – A brand-new version of our Glen Echo style, 10 x 10 bunkie featuring a front and back dormer and an increased roof pitch. In most cases this small cabin will save you the trouble of getting a permit! If you’re not sure, view our cabin favorites for inspiration. See how others in your shoes have modified Summerwood styles to make them their very own. Maybe you live in a rural area, or maybe you’ve just purchased or come into some land. It’s beautiful and you’re excited to show it off to friends and family. But is the place big enough to house everyone comfortably? Regardless of what you’re going to use your cabin for, there are a few things you should consider before entering into the design process. Below, we’ve got a few questions to consider before building your very own custom cabin. Let’s get those wheels turning! You may need to insulate your cabin depending on what climate you live in. If it gets chilly where you live, you’re probably going to want to insulate the building so you can use it year round. If you are adding plumbing, you may also consider adding insulation to ensure your pipes don’t freeze during the colder months. Yes, a cabin definitely needs ventilation. Consider that someone may not be there all the time to open a window, perhaps it’s a vacation property that you only visit on weekends or holidays. Air will get stale and can lead to rot and major air quality problems down the line – such as mold. No thanks! Summerwood cabins come with cedar or maintenance-free vents in the gable roof, to ensure your building is always breathing in the fresh forest air! In most cases you will need a permit for a cabin as you’ll probably want it to be a bit larger than the average shed or pool cabana. If you’re planning on making it larger than 100 square feet, or adding plumbing, you will have to go through the permit process. Learn more about obtaining a permit, and how we can help in “Building Permits: What You Need to Know”. A cabin this size definitely needs a permit. Yes! You should always stain or paint a cedar sided building. Unlike a deck or a fence, which you can let grey and whether over time, when cedar is used as a siding material it should be maintained. Since the idea is to keep the elements out, you’ll want to stain the structure to ensure the wood does not warp or rot. If occasional staining just isn’t for you, consider a maintenance-free option, such as Canexel. It has a 25 year warranty and comes in a multitude of colours. Read more about weathering in “Understanding Weathering: The Effects of Rain or Shine on Your Outdoor Storage Unit”. Paint your building whatever colour you like! Storage can be tricky in a small cabin space, but a loft is an ever popular solution. If you’re working with a gable roof building, it’s very easy to incorporate a loft space. If a loft is what you desire, we’ll add a floor and a ladder, and voila! A loft can be used for storage, but is also beloved by children. The little ones won’t mind sleeping in a loft space either, but you may have trouble convincing them to ever leave! Our Ultimate Cottage Bunkie provides a loft, and an overhang without impacting your footprint. What goes on the roof? Shingles are by far the most popular roof material. The options for colours and styles of shingles are truly endless. If you do choose to add a loft space as mentioned above, consider whether or not visitors will be sleeping upstairs. A tin or metal roof, although durable can create a noisy atmosphere when it rains, so it’s important to keep interior comfort in mind when choosing roof materials. Can I include outdoor living space? You absolutely can include this in your cabin design! After all, you’re there to enjoy the great outdoors. If you would like to add a porch to your building, keep in mind that it will count towards your overall footprint. A porch is included in this calculation as it is supported by posts. 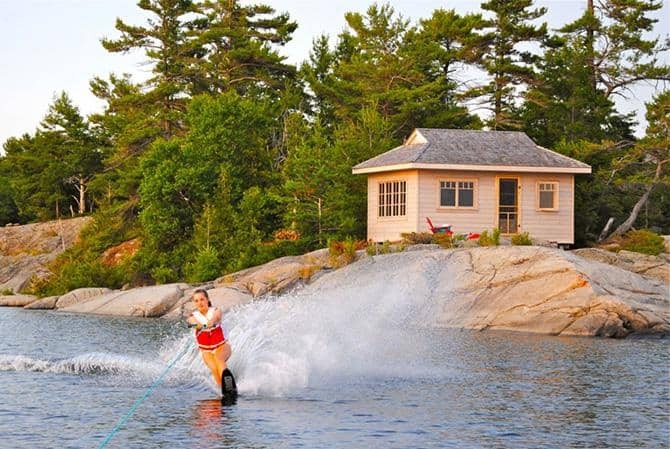 If this is a concern, perhaps our Ultimate Cottage Bunkie would be preferable. It also provides a front-porch like space, but with just an overhang. Because the structure is cantilevered, this overhand does not count towards your overall square footage. Read more in “Spring Best Seller: Permit Free Cottage Bunkie”. Foundation is dependent on a few factors: is the ground beneath flat and level? Is there a slope? Can rock or stone be found under the ground? Is the structure near water? Our design experts are here to help determine what kind of foundation is best for your particular situation, that’s why we call ourselves custom builders! The underlay of your building can be as simple as gravel and patio stones, although this is generally more appropriate for smaller or shed-like structures. A concrete slab, or piers is more likely what you’ll need to support your cabin foundation. Concrete piers can help get you right on the water. A few years ago, we assisted Tracy and her husband when they bought a cottage in Muskoka, Ontario. Initially, they didn’t consider a guest cabin, and they lived comfortably in their space for quite some time. As the family grew, and new grand-kids, nieces and nephews began to visit the property, they realized they could use some more space. The need for more space for friends and family was apparent, but they didn’t have time to build something themselves. Tracy and her family had the cabin built just off the driveway, right behind the main cabin. “It’s the first thing you see when you come up the driveway.” First impressions matter, so it needed to be adorable! You decide just how cute, or rustic your perfect custom cabin will be!